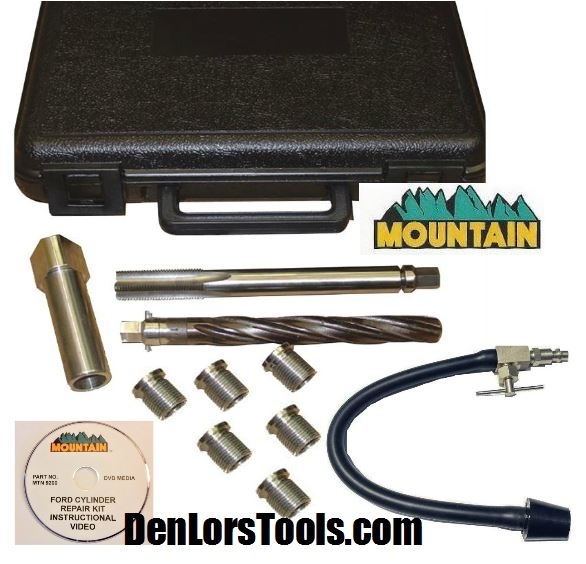 Mountain MTN9200 Ford spark plug insert installer for doing first time repairs and also works for over-size repairs when a parts store kit like Helicoil Save-A-Thread or Dorman has failed making the hole larger. Questions on application? Call our Master Tech at 800-524-9783 x251. With this tool kit, the cylinder can be repaired without removing the head - takes a little less than an hour, saving the mechanic about 1 day worth of labor. Alloy steel insert is a quality insert that will permanently mount in the spark plug hole and will not deteriorate or fall out. Line-up guide insures that tap and reamer are used in a straight line - no installing the spark plug crooked. Comes with an instructional DVD that explains job in detail - easy to follow instructions. Cost of this spark plug thread repair kit is far less than the competitors in the field. Designed to aid in repairing Ford modular cylinder heads. A quality fool proof repair system that is fast, cost effective and simple to use. Used to repair damaged threads from blown or deteriorated spark plug thread in 4.6L, 5.4L, and Ford V10 Triton and other 2V Ford 4.6, 5.4 and 6.8 engines. See Calvan 38900 listing for more application help. The Calvan 38900 is the same as the Mountain 9200, except Mountain 9200 has 6 inserts and Calvan 38900 has 8 inserts all tooling is the same. 3. Reamer 11/16" (Core Drill). 4. DVD Instructions & written instructions. 6. Qty of 6, M14x1.25 taper seat spark plug inserts. Replacement or additional Mountain 9200 spark plug inserts use part number 9201. 7. Cylinder leak tester. Used to make sure the valves are closed. At checkout just write "Tips" in the Comments field and we will email extra helpful tips when processing the order. Tips - Emailed free after purchase. Frequently asked questions below in this series of common questions that we get about Ford Spark Plug Blowouts. Mountain 9200 is a spark plug port repair kit for 2V Ford, Mercury and Lincolns that have blown spark plugs 4.6, 5.4 and 6.8 engines.